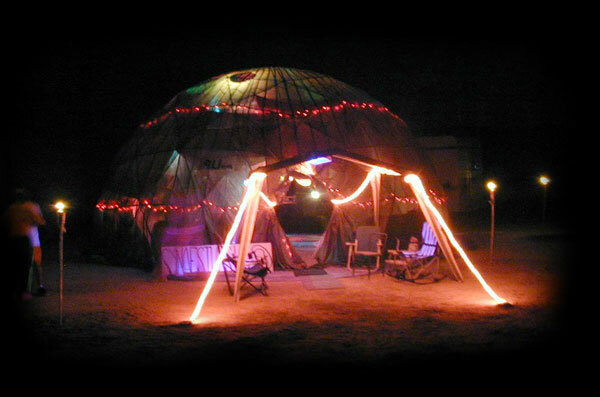 Camp Synaesthesia was conceived and established for Burningman 2000 to provide pleasant stimulation for all the senses of the residents of Black Rock City. This year, we will be located at 300° and 3100'. Step into the womb and feel the aromatic imagery and palatable sounds of your own synaesthetic experience. Camp Synaesthesia is sustained by aesthetes from both the Los Angeles and Bay areas, whose special talents and skills created the elements that contributed to your immersion into the womb and the many curiosities of synaesthesia.